About a year ago we got TiVo. Without exception, it is the greatest thing to ever happen to TV. The most immediate result was that we were no longer homebound Sundays nights between 9:00 and 10:00pm. We were free to watch, in crystal clear digital quality, the adventures of Mulder and Scully regardless of Fox's schedule. Life was good. And then the end came. Our little televised world ended and the X-Files was no more. A good friend of ours asked, "Without X-Files, is there a reason left to own a TV?" 24 of them, in fact. At first glance, "24" is just a concept show. Each episode is one hour, shown in real time – 24 episodes in a season combine to form one whole day. But it's the writing that really makes the show. 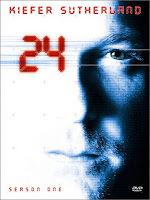 "24" oozed suspense and tension. The episodes started with us sitting on the edge of the couch and ended with us screaming at the TV as it faded to black. They were so engaging, we forsaked TiVo and watched them live. We had to. We couldn't wait. Now, some have called us obsessed. I prefer to think of us as enthusiastically addicted. The first season dealt with several parallel and intertwining plots. Jack Bauer (Kiefer Sutherland), head of the LA Counter-Terrorism Unit (CTU), has to wrestle with a plot to kill the first African-American presidential candidate, Senator Palmer (Dennis Haysbert), while trying to free his family (Elisha Cuthbert and Leslie Hope) from Serbian terrorists commanded by Victor Drasen (Dennis Hopper). In the course of the show, Mrs. Bauer gets amnesia, a naked lesbian blows up a jetliner, Lou Diamond Phillips gets killed, first one, then two moles compromise CTU, and an intricate power struggle is fought in the Palmer campaign between the Senator, his wife, and their spin doctor. All through the first season we encouraged our friends and family to start watching the show TV Guide called "the best new show on TV." Fox even helped those late-comers by re-airing episodes a week behind schedule on FX. Alas, given the nature of the show, many people would start watching episode "11:00 to 12:00" and find themselves hopelessly lost. So we're telling you now...before the second season starts. Watch "24" from the start and we guarantee...you'll be hooked.